How do you delete a class? I imported a mis-formated roster and now when trying to add the same class correctly it just adds those students and 5 copies of that student with the students first name as their ID number. So for 25 students in a class it shows each one 4 to 8 times and still incorrectly. 😦 I can’t find “delete class” anywhere. We can delete your class for you. Send us an email to support@forallrubrics.com with the name of the class(es) you want deleted. How do you delete a student from a class? 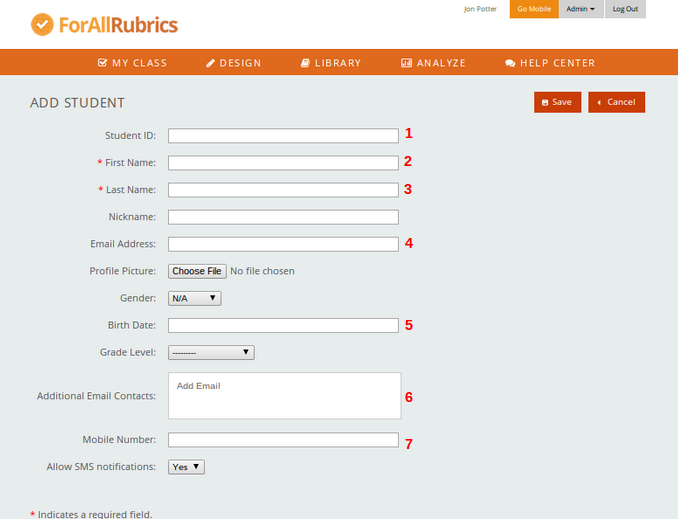 Click on the Admin button in the upper righthand corner of the ForAllRubrics webpage. Then choose manage students. You can click on the X in the righthand column to delete a student. Do I need to enter each student for an ID or is there a quicker way as in importing a group e-mail list from your google-account (which I signed up with)? Thanks. We don’t yet import students from Google, although it is on our to do list. We do support importing students from a spreadsheet or through Edmodo or Powerschool. To import students from a spreadsheet, click on “Admin” in the upper right corner of the screen in ForAllRubrics and then select Manage Students. Is it possible to delete a class ourselves or do we need to contact you guys and have you do it for us each time? So when I have my classes set up in powerschool do you import them or can i do that? We only support Powerschool integration for School and District accounts, not for the free teacher accounts. If your School or District in getting an account, please get in touch. Importing the roster breaks as soon as it hits a letter with any diacritics. Could you email the roster that you’re having problems with to support@forallrubrics.com ? We’ll take a look and figure out why it isn’t working.